You knew about the hot flashes, but were you also aware that the menopause can induce hair thinning and hair loss? If you're living it right now, you do — and you'll want to know what you can do about it. All women will hit the menopause sooner or later, and this big change — which announces itself with unpleasant symptoms like hot flashes, night sweats, fatigue, insomnia, and mood swings — does more than just make your menstrual periods grind to a halt. Thinning hair, or even hair loss, is another thing you can start to notice around this time. Why does the menopause sometimes induce female pattern hair loss? In addition to hormones — which can't be to blame for everything — the normal aging process also plays a role in causing hair loss in women. Stress, too, contributes, and that includes emotional stress, illness, and extreme dieting (physical stress). Certain medications additionally cause hair loss or thinning as a side effect, while thyroid disease can also be a culprit. This is why it's important not just to accept hair thinning or hair loss as normal, and see your doctor — blood tests can help you find out what is going on, and perhaps find a solution for problems that go well beyond hair. Do you love your hair straightener, hair dryer, or curler? Think again — heat treatments can make hair loss worse. 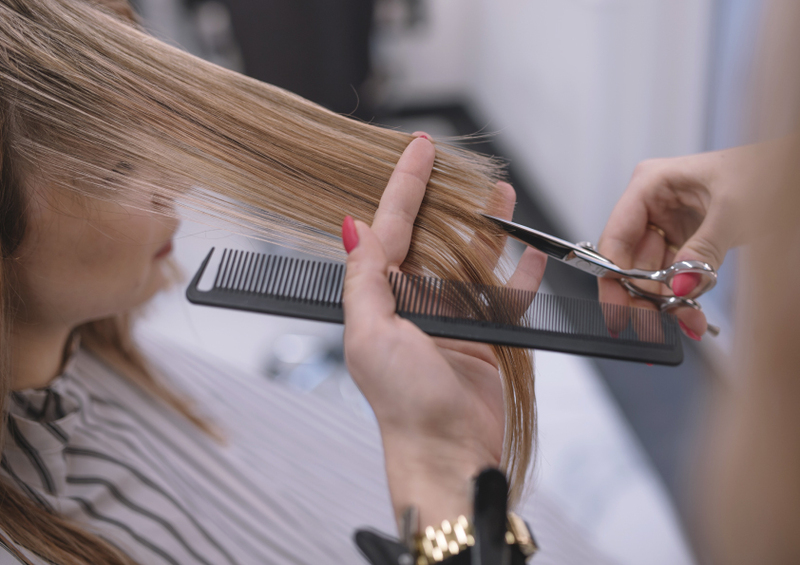 Hair cuts that rely on volume may hide the appearance of thin or bald spots, meanwhile, and volumizing shampoos, conditioners, and serums can also work wonders. 2. Dry scalp? Zinc and selenium to the rescue! Have you got a dry scalp? Try a shampoo with zinc or selenium, which should reduce dandruff, help your hair look better, and call less attention to thinning spots. Don't wash your hair too often, however, as that can contribute to a worsening of your hair's condition as well. You may be hoping to keep menopause-related weight gain to a minimum, but you do need healthy, mono-saturated, fats — olive oil, sesame oil, canola oil, and peanut oil all contain these. Vitamin B6, omega-3 fatty fatty acids found in fatty fish and supplements, and green tea may have a positive effect on your hair health as well. Women suffering from hair loss can try pharmacological treatments, like minoxidil (Rogaine), which is available over the counter and has been proven to combat hair loss. This topical treatment takes a few months to start working, and if you stop using it, your hair loss will continue. Biotin, the "hair, nail, and skin supplement", has been shown to actually work — not miracles, but some. You can buy biotin over the counter. We all know that lasers can be used for hair removal by now, but did you know that it can also induce hair growth? While the safety and efficacy of these laser treatments aren't yet clear, because it's a fairly new thing, low-energy laser lights just may help you regain some of your hair if you are suffering from hair loss. 7. Can exercise help stimulate hair growth? Long-term exposure to sunlight can further damage your hair, so maybe avoid going jogging or walking in the hot sun. Swimming is wonderful for the body, but chlorinated pools can lead your hair to break — wear a cap if you swim in one. We all know smoking is all sorts of bad. The reason (peri)menopausal women are often advised to quit smoking, if they still are, isn't just to prolong their life and improve their health, though. Did you know that using tobacco products lowers your estrogen levels? This is why it's thought to induce hot flashes, among other things. Stopping smoking may lead to healthier-looking hair, too.